Sutton is a bustling, multicultural borough in southwest London. Formerly a part of Surrey until the 1960’s, it retains a controlling streak of ardent conservatism bordering upon fascism, which is evident from the behaviour of its (unelected) local council bureaucrats, elected councillors and members of parliament. The class pretensions of these ruling elites are clearly evident by the fact that the recent and expensive renovations to Sutton high street are designed to make the city look more like Paris! Sutton used to be considered recession proof in the past, but since the coming to power of the far-rightwing ConDem national government in the UK, with its sweeping benefits cuts, dismantling of the welfare state and privatisation of the National Health Service, the local economy has rapidly deteriorated. Where there were once busy shopping centres thriving with eager crowds, there are now boarded-up premises, pawnbrokers, charity shops, and ‘cheque-clearance’ businesses, etc. Despite being run by a conservative elite, Sutton still has an extensive working class population living in poorly maintained high rise flats built in the 1960’s. Many of these estates are clustered around the city centre of Sutton, where the council provides play areas for the local children in the numerous parks. During holiday times thousands of children visits these areas with their parents throughout the day. Watching for an hour it is evident that capitalist exploitation is already firmly implanted in the young working class children through conditioning received from parents and community. Children compete with one another over resources in the playground, which manifests as who controls what toy, and for how long. Stronger (and slightly older) children bully and intimidate the younger (or weaker) children for no other reason than to establish power and influence in the play area. A more dominant child has a greater choice of what toy to exploit, and when. A stronger child in this context is in fact the most ignorant of the group, who has not been taught proper social boundaries, or respect for others. A weaker child may not be ‘weaker’ at all, but in fact better mannered and more considerate – but in the fight for influence, good manners are eclipsed by the immediacy of an arbitrary show of strength. The capitalist inspired individualism that adults use to oppress one another through class antagonisms – is evident in young children as they interact in a playground that prepares them through social conditioning – for a life of being an exploiter, or of being exploited. Blatant aggression is protected through the auspices of the conventions of bourgeois law and the prevailing fade that constitutes the preferred attitude toward children and their upbringing. To correct a badly behaving child in public, particularly a child that is not your own, could be construed as some kind of ‘abuse’, or ‘assault’, whilst the stupid actions of ignorant parents are view as ‘correct’ and ‘healthy’ due to the biological link. This is despite the fact that they are, as members of the working class, simply perpetuating patterns of behaviour toward their children that have been inflicted upon them through bourgeois oppression, and which have been passed on to them from their parents and community. 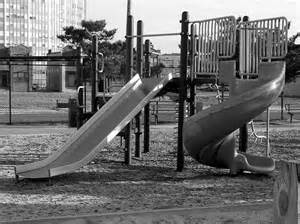 The inner-city playground is a microcosm of life within the working class. It essentially represents a prison that everyone knows they are held within, but which no thinks of escaping from. Instead of fighting their out of the prison and turning their anger against their guards – the bourgeoisie – the working class turn their anger toward one another and a fight to dominate the prison (amongst the prisoners) ensues. The cycle of oppression remains unbroken and continues down through the generations. What children should be taught is how to communicate effectively with one another, and how to plan actions that best serve the group and make life more productive and happy for all concerned. The tragedy is that many working class parents and children are evolving out of this quagmire of unquestioned ignorance, but are being held back by isolated but dominating forces that always attempt to turn back progression to an earlier time of brutal hierarchy.